I had the most unexpected epiphany while eating the Arturo pizza at Folliero’s in Highland Park, CA. I love this pizza. It’s mozzarella, eggplant, and garlic—that’s it. No sauce. Imagine crunchy, chewy dough with ribbons of roasted sweet eggplant, salty melted mozzarella, and an occasional bite of garlic. I love it so much, it’s pretty much the only thing I order. But every time I eat it, my thought is… this needs nori. Would it be weird to sneak some in to the restaurant? Yes, it would be. So I tried it at home and can confirm my suspicions to be true! The nori takes it to the next level. Perhaps the umami factor is at play here? Whatever the case, I love, love, love it! I also did another version with shiso. I know, I know… enough with the shiso. It was good, for sure, but I think just the nori keeps things simple, as they should be. When I’m lazy, I use the Trader Joe’s ball of pizza dough. When I’m up for it, I use the recipe from The New Best Recipe. It’s considerably better to make it at home, but sometimes I just don’t have the time. I’ve also added ricotta in my version, but not entirely necessary. Preheat the oven to 450 degrees. Trim the top of the eggplant and slice thinly lengthwise. Place in a bowl and add a generous amount of olive oil, a couple of pinches of salt and pepper, and toss with your hands, making sure the eggplant is evenly and well coated. 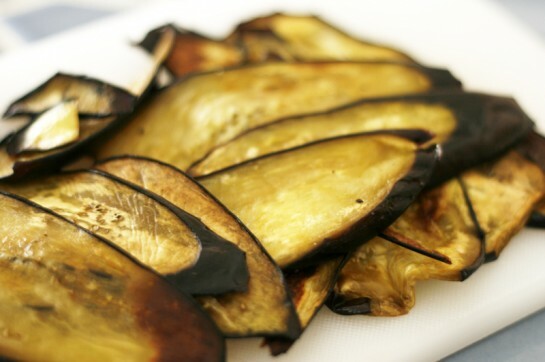 Lay the eggplant flat on a baking sheet and roast for about 10 mins. Keep an eye on them—cooking times will vary depending on their thickness. Once soft and just starting to brown, remove from the oven and set aside to cool. Increase the oven to 500 degrees. Roll or stretch out the pizza dough and place on a baking sheet. Evenly distribute the toppings—first the mozzarella, then garlic, eggplant, and dot with spoonfuls of ricotta. Bake for 8–10 mins, keeping a close eye. When the cheese is bubbly and the crust is starting to brown, remove from the oven. 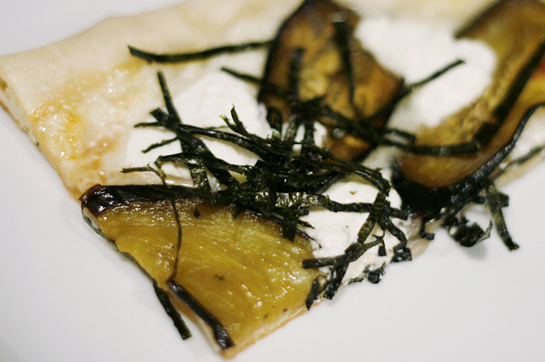 Sprinkle with nori, cut into slices, and serve. This entry was posted in Contemporary Recipes, Favorites and tagged bake, dough, eggplant, italian, mozzarella, nasu, nori, pizza, ricotta, roast, seaweed. Bookmark the permalink. Post a comment or leave a trackback: Trackback URL. Thank you once more for the Shoyu Chicken recipe (I have posted it this week and have already had it three times since in the last two weeks!). Sissi, the pizza really is a must-try! The photo doesn’t do it justice, but I had to post it because it was that good. Glad you’re enjoying the shoyu chicken! Hi Kathleen, we love Folliero’s! My new favorite is the Rigatoni Rene…my husband didn’t like eggplant, but now he orders this dish too. It’s SO GOOD. Let me know how the furikake turns out!